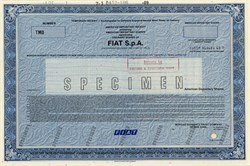 Beautiful engraved specimen certificate from the FIAT S.p.A dated in 1989. This historic document was printed by American Bank Note Company and has an ornate border around it. This item is over 23 years old. Giovanni Agnelli founded Fiat in 1899 with several investors and led the company until his death in 1945, while Vittorio Valletta administered the day-to-day activities of the company. In 1903, Fiat produced its first truck.8 In 1908, the first Fiat was exported to the US. That same year, the first Fiat aircraft engine was produced. Also around the same time, Fiat taxis became somewhat popular in Europe. By 1910, Fiat was the largest automotive company in Italy � a position it has retained since. That same year, a plant licensed to produce Fiats in Poughkeepsie, NY, made its first car. This was before the introduction of Ford's assembly line in 1913. Owning a Fiat at that time was a sign of distinction. A Fiat sold in the US cost between $3,600 and $8,600 ($73,909 to $176,561 today). Compare this to the $825 ($17,000 today) Henry Ford charged for his first Model Ts in 1908.11 However, upon the entry of the US into World War I in 1917, the factory was shut down as US regulations became too burdensome. At the same time, Fiat had to devote all of its factories to supplying the Allies, producing aircraft, engines, machine guns, trucks, and ambulances. After the war, Fiat introduced its first tractor. By the early 1920s, Fiat had a market share in Italy of 80%.13 In 1921, workers seized Fiat's plants and hoisted the red flag of communism over them. Mr. Agnelli responded by quitting the company, retiring to private life, and letting the workers try to run the company. Shortly afterward, 3,000 of them walked to his office and asked him to return to the helm � -a request to which he reluctantly agreed. In 1922, Fiat began to build the famous Lingotto car factory � the largest in Europe up to that time � which opened in 1923. It was the first Fiat factory to use assembly lines. Fiat made military machinery and vehicles during World War II for the Italian Army and Air Force and later for the Germans. Fiat made obsolete fighter aircraft like the biplane CR 42, which was one of the most common Italian aircraft used along with the Savoia-Marchetti, and also made light tanks and armored vehicles. These were weak compared to some of the German and Soviet counterparts, but were still used often. The best Fiat aircraft was the G 55 fighter but arrived too late and in too few numbers. In 1945 � the year Hitler's ally Mussolini was overthrown as leader of Italy - the Italian Committee of National Liberation removed the Agnelli family from leadership roles in Fiat because of its ties to Mussolini's government. These were not returned until 1963, when Giovanni's grandson, Gianni took over as general manager until 1966 and as chairman until 1996.